I was talking with some folks the other night, one had written three books, another five. “It’s like having a baby,” they said, “it hurts so much you swear you won’t do it again, but you forget the pain.” I can proudly declare I stopped after one book. But but… there’s all these books that don’t exist yet but should. Who will write them? One of those books that doesn’t seem to exist is the small (small as in fits-in-your-pocket small) book for product managers, programmers, and business people to understand how human-centered software design gets done. By that I don’t mean how to start doing human-centered software design, there’s plenty of good resources for that (e.g.). And there’s good resources for people willing to devote the hours of reading it takes to get through a 350+ page book (e.g.). But in my experience people just don’t have that much time to devote to anything outside their area of focus unless they’re changing careers. 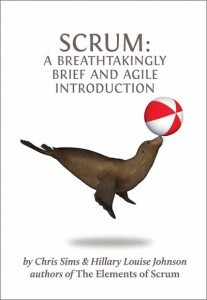 Scrum: A Breathtakingly Brief and Agile Introduction is a wonderful little book that does exactly what it says on the label. It slips neatly into your pocket for reading anywhere anytime. There’s even space in there for a few useful illustrations. As a non-programmer needing to understand how my programmer colleagues are working, it’s perfect. I want to give them the same kind of book to understand what I do.